Size: Trilobite is 2.8" long, 2.35" wide! 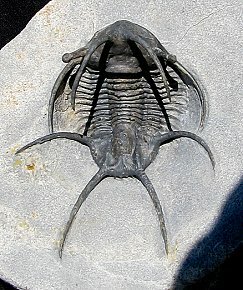 This is a fabulous spiny trilobite. It is a HUGE Ceratarges Type "B" from the Devonian of Morocco. This remarkable bug has been meticulously prepared in the EXTINCTIONS Prep Lab here in Colorado. This 3-dimensional trilobite is very well preserved and exhibits outstanding detail. The bug has a pair of long, arching occipital spines (''horns'') - these spines have been prepared in a free-standing manner. The large eyes are borne on the ends of long stalks - these have also been prepared free of matrix. All four tailspines and both genal spines are quite long and beautifully displayed. And this trilobite is HUGE - almost THREE inches long! This is a super display example of this distinct spiny trilobite - simply a centerpiece specimen.